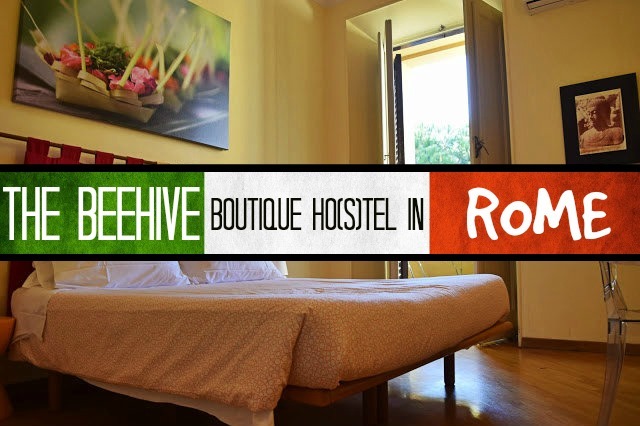 The Beehive is an eco-conscious, stylish, boutique hotel/hostel in a great central location in Rome. It's run by a lovely American couple, and offers lots of different types of rooms. We were welcomed by Yulie, who was really lovely. She showed us the cafe and lounge and then took us over to our room. There are four different types of rooms at the Beehive - "Classic": rooms with shared bath; "The Sweets": rooms with private en-suite; "The Hive": dorm beds and "Other Honey": rooms with a shared kitchen. We stayed in the Sweets. We had a spacious, bright room with a private en-suite. There was free (super duper fast) wifi, a safe in our room and a shared kitchen with fridge and kettle available to use. Although the kitchen isn't fully equipped (no cooker or microwave), it was still a great asset. It had everything we needed to make tea and even sandwiches. One of the bad things about travel is not always having a place to prepare food, the Sweets at the Beehive has this and it really helped to make us feel at home. Our room had air-con, which was not needed as it was December, but if you are visiting the hive in summer, I would highly recommend either the Sweets or the other rooms which have AC (trust me, you will be needing it, Rome without air-con in the summer is a no-no). We especially liked the small balcony, although it was December the weather was beautiful in Rome and it was a great place to hang out and have a cup of coffee. In the en-suite bathroom there were organic, plant based soap and shampoos - further proof that they are eco-friendly. The location of the Beehive is very central and was what initially attracted us (like bees to a beehive). The Beehive is just two blocks from Termini - the central station in Rome that's not just the hub for reaching the rest of Rome, but also the whole of Italy. This also means that the Colosseum, Roman Forum, Palatine Hill and the Trevi Fountain are only a 20 minute walk away, with plenty of cool things to see on the way. Basically, the Beehive is in a great place for sight seeing in Rome! All guests at the Beehive have access to the garden and the lounge - two cute little spots perfect for hanging out and meeting fellow travellers. The lounge also had an iPad for guests to use! Although a stay at the Beehive does not include breakfast, you can still add on breakfast to your stay. Being an eco-conscious hotel & hostel, their menu is vegetarian with lots of vegan options too. They also serve beer and organic local wine throughout the day and evening - 2 Euros a glass or 8 Euros a bottle. Additionally, they also offer vegan and vegetarian cooking classes! The Sweets are actually in a separate building to the Classic, the Hive and the reception. The Beehive really does live up to its description: it was super eco-conscious with its vegetarian/vegan menu, organic wines and soaps; it was boutique; and it toed that sweet line between budget and comfort. Add to that a great central location in Rome and you can see why we're recommending this place to all our best bee friends!! And don't forget to follow them on Facebook, Twitter and Instagram! And to stay in touch with us, follow us on Facebook, Twitter and Instagram too! Disclaimer: Travelling Weasels were invited as guests of the Beehive, but as always, all opinions are our own. We would never recommend anything we haven't personally tried and loved, because that would damage our credibility.